As we continue to grow and scale our European business through 2015 and into 2016 I am thrilled to welcome Sam Jones to our Galway team as EMEA Sales Manager focused on our API products. Sam comes to us from our Boston office where he has been a high performing sales leader since joining the company in 2011. Sam recently sat down with the team at mlkinire.com to discuss what its been like relocating along with his wife and two young daughters to Ireland. The following is an abridged version of our conversation, edited for clarity. So you have been in Galway a few weeks now, how’s the family settling in? We’ve got a great house on the outskirts of Galway in a town called Oranmore, next door to cows and horses, soaking in the country air, which our kids absolutely love. Aside from a quick trip to hospital and getting used to the Irish “summer” the Jones family are settling in very well. Can you tell us a little more about what you were up to at SmartBear the last few years in Boston? For the previous 18 months I led the North America API sales team, responsible for driving the growth of our API testing platform from a new perspective as we transitioned from a single point product to an end to end solution. Prior to managing and growing the team I began my SmartBear career as a sales rep, and had the good fortune of selling the same product line that my team in Galway now sells. And you are from England, correct? That’s right, originally from the south east of England before meeting my wife and shipping off to Boston in 2010. And what about your family connections to Ireland? You wouldn’t know it with a name like Jones but the entire family are Irish. My parents moved to England in the early 80s but Grandparents, Aunties, Uncles, cousins etc. are all still here. Growing up I couldn’t wait for our yearly visits to Cork, where the majority of my family still live. I can still remember being astonished at around 9 or 10 years old watching my first hurling game. Two decades later and I still list standing in Croke Park watching the All-Ireland Hurling final at the #1 spot on my bucket list. I’m hoping a few of the lads in the office can pull through for tickets (no pressure Mr Berry) and I can cross this off my list come September. What will you be working on in the Galway office? As I mentioned earlier I sold our API testing product line as a sales rep before transitioning into management. This hands-on experience has enabled me to take on more of a manager/coach role. My sole focus is to work together with each rep on my team to maximize their success. I live by the simple mantra that the more successful each rep becomes the more success the team achieves. Fundamentally I believe that success in sales is achieved through a high number of quality conversations which genuinely add value to your customers and prospects. Outside of working for an outstanding boss what was the biggest reason you were interested in the transfer from Boston to Galway? Miles – you were the only reason for the move. But if I have to pretend there were others; during the last two years my team in Boston has been solely focused on North America. This transfer has given me the opportunity to better understand our customers approach to achieving maximum software quality across EMEA and how they evaluate, select and purchase software. Although I was born and raised in England, I wasn’t long out of University before I was whisked off to Boston by my wonderful wife and joined SmartBear. My software experience has so far been shaped from an American perspective. Europe, Middle East and Africa make up nearly 30% of our global revenue and we’re driving towards increasing that percentage to 40%+ over the next 12-18 months. Joining a team within such a strategic region and with high growth targets was a no brainer. Believe it or not “strategy and growth targets” however aren’t something my wife cares as much about so I had to build a compelling case including relinquishing my argument that getting a dog isn’t a good idea. I grew up experiencing the wonders of Ireland and the move will allow my wife and two daughters ….and new dog to do the same. If anyone reading this knows where we can get a Labradoodle please get in touch, apparently that is the dog we want. What are you most looking forward to about living back in Europe? We hope to travel as much as possible during our time here both within Ireland and Europe. Having been in Boston for the last five years it’s been challenging getting back to the motherland for weddings and family events. This move gives us a great chance to spend as much time as possible with the Jones side of the family. I’m a big Arsenal fan so getting over to the Emirates once or twice with a few of the lads in the office is on the to-do list. Although I diplomatically endured American sports to win the approval of my father-in-law, it won’t come as a shock to anyone that real football, the one you kick with your foot for 99% of the match, holds precedence. Any Irish culture you’ve experienced so far you care to share? 1) When asked “how ye keepin” the Irish truly mean it. Recent example: while at the grocery store I watched a family of four run into an old fella they must not have seen in a while. After the father asked how the guy was keeping, and I went about my business filling up our shopping cart, 40 minutes later the fella was still talking. 2) Five minutes in town and already welcomed like family. Recent example: the morning we landed, fresh off the red-eye from Shannon we take the kids for a walk to meet our new neighbors (horses and cows). Our actual next door neighbor spots us and shephards us immediately into her house for tea. After offering an entire table of sweets she goes to the fridge for a chalice of freshly milked milk. Straight from the cow in her front yard! Still wish I had my camera ready to capture the look on my wife’s face when presented with the milk that was just a bit too warm due to how fresh it was. What’s been your biggest takeaway working with your new team so far? The Irish are 10X better at rapport building than I will ever be. The team is talented, focused and understand its not every day you get the chance to sell a globally recognized technology that provides genuine value to it’s customers. This is a once and a lifetime opportunity for me and my family and we are going to make the most of it. Outside the new Jones estate, summer 2015. 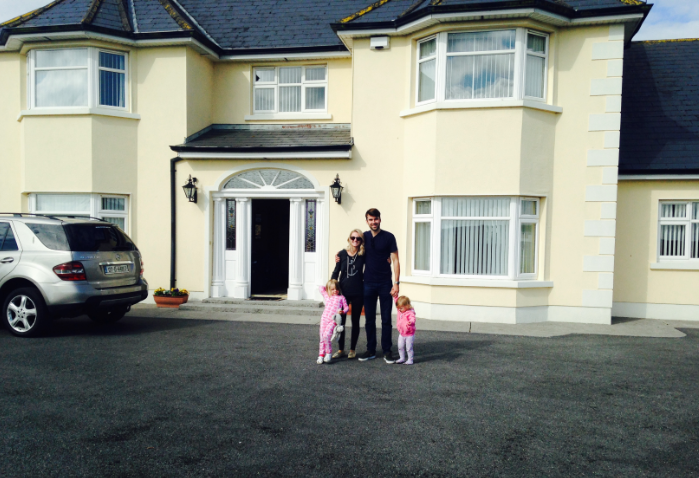 On behalf of the entire team we officially welcome the Jones clan to Ireland and the SmartBear Galway family! Grat addition to the team!